One of the most important tasks of youth participation in the movement of compatriots is to ensure that the second and the third generations living abroad would not lose their roots, connection with the homeland, their language and culture, understanding of reality and values. This was announced on the 5th of April by the director of the department for work with compatriots under the Ministry of foreign affairs of Russia Oleg Malginov in Salekhard within the World Coordination Council of Russian compatriots. He underlines that it is not so easy to do in the foreign language environment. But, at the same time, there are excellent examples, when representatives of the first waves of Russian emigration preserved their faith, Russian language and knowledge of history. “Thus, they keep Russia abroad”, he said. According to Oleg Malginov, now the time is changing, and the youth is different a little, but young people also have a desire to keep. For example, the movement of compatriots in the Coordination Council has the special program on attracting of young people. Youth councils are being created in countries, and they are already choosing new forms of work for themselves, what is connected with the Internet, quests, mass movements for preservation of monuments and many others. The conference of compatriots in Italy will take place in a couple of days, where they are also planning to create a youth wing of the Coordination Council. Youth chambers of the Coordinating Council already exist in Great Britain, Argentina and other countries. “We offer young people to be more active, and we rely on them. We can not know for sure what they will be interested in right now. We can create conditions for them to keep in touch with their homeland. We carry out programs to form their professional skills that could be useful to them in life abroad. This is very popular. We are glad when compatriots, if they have chosen to live abroad, are self-sufficient, authoritative people, and their opinion is listened to by inhabitants of the countries, where they live. So they can convey the truth that they know about Russia to their neighbors. Just today there will be a small discussion on business opportunities. Young people are interested in opportunities of growth and settling in life. Business gives such an opportunity”, concluded Oleg Malginov. It should be noted that support of the children’s and youth movement is a priority in work of the region with compatriots. Thus, the participants are visiting the town Labytnangi, meeting with the head of the town Marina Treskova, getting acquainted with the project “Formation of comfortable urban environment”. The guests of Yamal are also planning to participate in interactive modules of the educational program of the Club of young diplomats “Geopolitics”. There are many examples. In 2017-2018 children-compatriots had a rest in the Crimea in the camp “Artek”, and 170 representatives from 26 countries have received such an opportunity for two years. Since 2011 young residents of Yamal and their coevals from other countries participate in the civil-patriotic project “Our History is our Victory” — they improve monuments, communicate with veterans and visit significant historical places. In addition, before the Victory Day they participate in the action “The Victory Banner — to compatriots”. 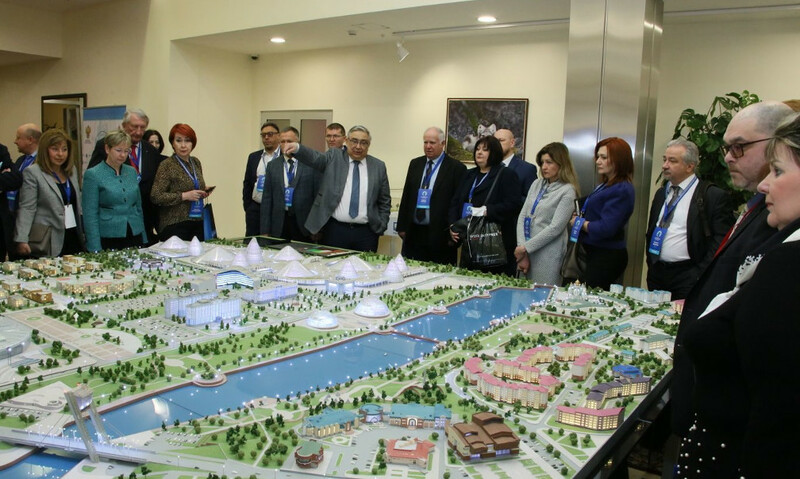 In addition, for many years Yamal has been cooperating in cultural and humanitarian sphere with North Kazakhstan region of the Republic of Kazakhstan. Thus, last year students of North Kazakhstan University, including volunteers, participated in the ecological expedition to Vilkitsky Island. Volunteers from Austria, Bulgaria, Chile, Germany, Israel, Ukraine and China also participated in the activities to liquidate the accumulated ecological damage. The international forum-festival of youth “We are for peace in the whole world” is the brightest project of Yamal in work with compatriots living abroad. During its existence it united more than 320 Russian compatriots from 41 countries and 1600 young people from 30 regions of our country. The annual international actions “Formula of peace” and “Formula of good” are the result. As it should be reminded, “The World Coordination Council of Russian compatriots living abroad” is being conducted for the first time in Salekhard. 25 compatriots from 20 countries — members of the Council and representatives of business interested in development of foreign economic cooperation with Yamal are participating in it.